South Africa 5-196 (AB de Villiers 69*, Hashim Amla 56, James Tredwell 1-25) beat England 7-193 (Alex Hales 38, Jos Buttler 34, Wayne Parnell 3-31, Imran Tahir 2-27) by three runs. 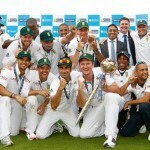 South Africa amassed 196 runs for the loss of five wickets in 20 overs and England was restricted to 7-193. AB de Villiers (South Africa) was declared ‘Player of the match’ for his outstanding unbeaten 69 off 28 mere balls with 3 giant sixes and 9 fours. The ICC World T20 – 26th match, Group 1, was played on Saturday, March 29, 2014, at Zahur Ahmed Chowdhury Stadium, Chittagong. Earlier, Stuart Broad, the captain of England, won the toss and invited the Proteas to bat first. Hashim Amla and Quinton de Kock gave their team a rising start by scoring 68 runs in 8 overs. The first dispatched his maiden T20 fifty on the 30 delivery and was gone at 90 for 56 off 37 with 2 lofty sixes and 6 fours. 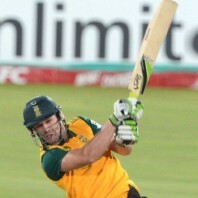 His partner departed eight runs later for 29 and the charge was taken by AB de Villiers. He punished the rival bowlers at will and smashed his 5th T20 half century on the 23rd ball while a few wickets fell at the other end. AB de Villiers secured his end for 69 as South Africa piled up 5-196 after 20 overs. Tim Bresnan, Chris Jordan, James Tredwell and Stuart Broad were the only successful bowlers with one wicket each. Alex Hales along with Micheal Lumb took off briskly by reaching 40 runs in four overs. The latter was dismissed at 46 for 18 and was replaced by Moeen Ali. Hales continued with his aggression but lost his wicket at 73 for 38 and Moeen went back to the pavilion at the same total for 10. 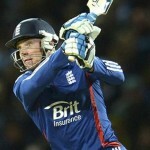 The Englishmen surrendered their fourth wicket at 105 when Jos Buttler and Ravi Bopara got together in the center. The batsmen tried to accelerate the run rate but were successful in enhancing the total to 131 when Buttler was caught by Albie Morkel off Imran Tahir for 34. Bopara became the 7th victim at 175 for 31 as England scored 7-193 in 20 overs. Wayne Parnell was the top wicket taker with three, Imran Tahir held one whereas Beuran Hendricks and Dale Steyn shared one wicket each. South Africa won the nail biter with a narrow margin of three runs and confirmed their place in the semi final spot.